When you think of the term vintage, one term that leaps to mind is “expensive.” That’s not necessarily the case when it comes to getting vintage hockey cards. There are a lot of older cards out there that won’t cause you to have to take out a second mortgage on your home to pay for – nor will you have to resort to ‘borrowing’ from some nice gentlemen in the back of a pool hall (and thus have to worry about any possible damage to your appendages later). Here are some old, cheap priced hockey cards that still offer a nice bang for your collecting buck. Of course you may have to target players that are of a lesser tier than superstars or you may have to settle for cards that are graded in the 6-8 range. Professional graders are tough but if you’re not obsessed with mint condition, you can still build a wonderful, high quality collection in the EX/MT to NEAR MINT range. Sets and singles from the late 1960s and early 70s can still be purchased at relatively reasonable prices. One can build a collection of graded Hall of Famers for a few hundred dollars if he’s willing to look deep on eBay, see what they’ve sold for and bid accordingly. There’s a set of cards called Ice Kings from the 30s that offer the chance to get individual cards ranging in price from $30-$200 – though finding one in mint condition will be a near impossible task. The most valuable card in the set is King Clancy , which is selling for nearly $400. It would be a nice thing to have in your collection, though. When it comes to single cards, Gretzky, Orr, Howe and a few others from the post-War era will sell for big money regardless of issue. However, there are dozens of popular players that can be had for reasonable prices. If you love the game's history, take on some of the less rare cards that are still fun to own. The 1950s Parkhurst sets are very popular and often colorful. Big names will cost big bucks but there are others that won't. 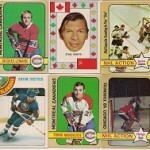 To find cheap priced hockey cards, look for fan favorites on popular teams: the great Canadiens' teams of the 1960s and 70s, the 1994 New York Rangers, the Edmonton Oilers of the 1980s, the great Boston Bruins squads from the Orr era; all have top players who were featured on hockey cards but aren't necessarily Hall of Famers. 1972-73 O-PEE-CHEE PHIL ESPOSITO #111 PSA 8.5 NM-MT+ "BEAUTY"
Should I Get My Hockey Cards Graded?